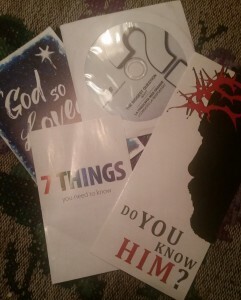 I‘ve been screamed at by street preachers, and some days, I get pretty nasty mail. 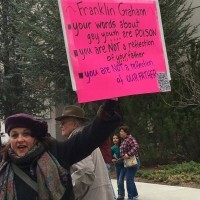 But protesting with a sign about Franklin Graham’s poisonous words spoken about gay youth at his “Decision America Tour” in Carson City, Nevada was yet another level of interesting. Though I am supportive of the work of Samaritan’s Purse, led by Franklin, I am frequently horrified by his words on a series of issues (immigration, refugees, Muslims, gays, and transgender people). Few have bothered me quite as much as the following words he spoke about gay children. 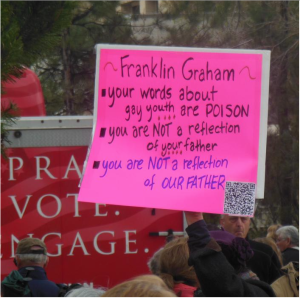 Franklin Graham — your words about gay youth are POISON; you are NOT a reflection of your father; you are NOT a reflection of OUR FATHER. 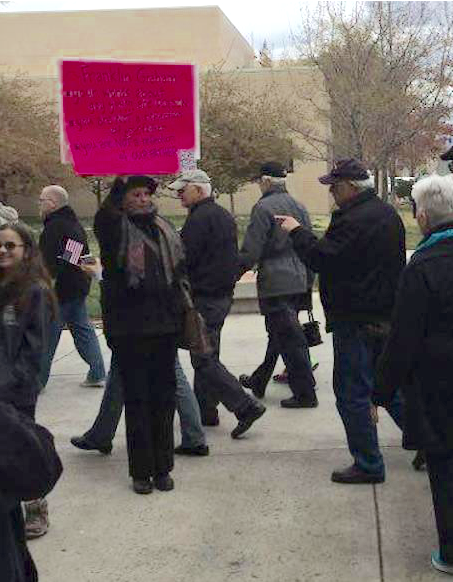 There’s the “distracting” pink sign. I arrived with a friend and her daughters just as Graham began speaking. I stood behind and to the side of his speaking stage and held my sign high. It knew the sign would be quite visible there. Trying a new tactic, Jack suggested, “Well maybe you could move to another place because your sign is distracting.” Of course it was distracting; it was shocking pink. 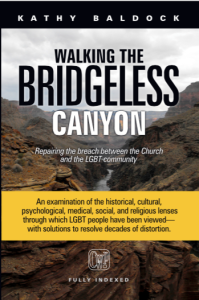 I responded, “I intend for it to be distracting.” Realizing he had failed to move or stop me, the chaplain said, “I thought so.” And he left me alone. For the 45 minutes that Graham spoke, I remained silent and kept my sign held high. I was just another rally attendee, but with a large pink sign. I bowed my head to pray when asked. I held the hand of the person next to me when asked, but adjusted my action to hugging closely one of the daughters of my friend. There was lots of craning to read my sign, but standing there, it was uneventful. No one spoke to me. That is, until I stood at a primary exit once the event ended. I stood on Graham’s stage exit path and held my sign up. I didn’t yell or challenge anyone. I smiled with nary a hint of sass or contempt. “Thank you” was my response to most comments. “You need salvation.” I am saved, thank you. “Lady, the judgment is coming for you!” Thank you. “Who’s your father, Satan?” I am a Christian. God is my father. Thank you. “You need to read the Bible.” Thank you, I do read the Bible. “You need to change your lifestyle.” Thank you. “God even loves you.” Thank you, yes, He does. “I’ll pray for you.” Thank you, I appreciate that. “God loves gay people too, He just hates their/your lifestyle.” Thank you, yes, God does love gay people. “You need to read the Bible. It says right there, if you could read, that God says it’s an abomination.” I have read the Bible. Thank you. 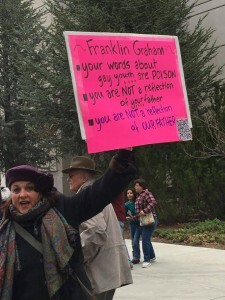 Now recall, my sign was about gay youth. Not gay people in general, not homosexuality, but gay children. I thought the safety and care-taking of children could be a rallying point most people, and certainly Christians, might agree on. Yet, only one person decided to engage that topic. I’d planned ahead and taped a printed copy of Graham’s egregious words on the back of my protest sign, along with stats from the Family Acceptance Project on the rejection of LGBT youth and a screen cap of my website showing the VERSES link. I showed the questioner Graham’s words and summarized them. “Yes,” she said, “But Franklin would not say that about gay children.” I showed her again this was a direct quote. Again, she said Franklin would never say that about children. Interestingly, even after showing her a direct quote, in her mind, Graham was not, and could not be guilty of calling gay children evil. Amongst the exiting crowd, were one 30-ish woman and her friend. 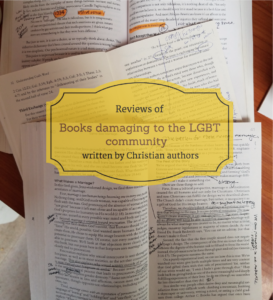 She yelled, “Homosexuality is an abomination to God; read your Bible.” Again, “Thank you.” The woman flipped me off contemptuously. “Excuse me,” I asked, “Did you just give me the finger?” She punctuated her reply by repeating the action. Sadly, the peace of God, which surpasses all understanding, had not stuck very long after leaving a prayer rally. A 40-ish year old man, who appeared to be quite charming (until he began to speak) took a tactic often used on me—the “smug and smart” approach. Assuming he knew far more than me, he wanted the six passages of Scripture explained right then. (Again, no engagement of the subject of my sign — gay children.) I offered him my card, pointed to a screen cap of my website highlighting VERSES, and suggested he read there. Dissatisfied with my summary, and likely having never heard anything like I offered, he again demanded, “No, tell me what the Bible says, not you. I don’t care what you think. I care what God thinks.” Again, I suggested going to the VERSES tab on my website, and repeated the context of the passages. He was becoming a distraction, so I turned back to the exiting crowd. Satisfied that I apparently could not and did not answer him, he walked away a “winner.” Sadly, he modeled his disdain of me to his teenage son. A few minutes later, the teenaged son of Smug and Smart asked me for a business card. I actually thought, as is the case with many younger Christians, perhaps he might be more open to another view point. Nope. He took my card, slowly tore it in two in front of me, and then Young Smug Reflection proceeded to tear my business card into smaller pieces as he gleefully and triumphantly skipped off. He too was “smarter” than I.
I did get a few positive reactions, very few. Two people, both with gay children, quietly thanked me for “being brave” and showing up. One mother with a gay son politely told me she loved her child, but hated his sin. I was grateful Yvette Cantu Schneider was with me at the rally. 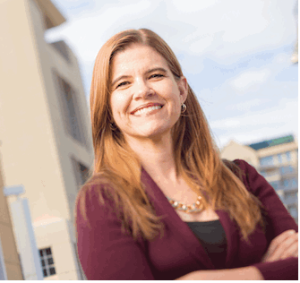 Yvette was a former policy analyst for the Family Research Council and the head of Women’s Ministries at Exodus International before they closed down in 2013. 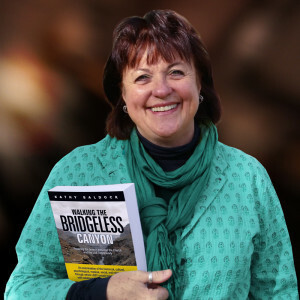 Yvette has since radically changed her views and we are friends. Yvette spent quite a bit of time speaking with the mom. It was disturbing to see the fear and anger that a simple sign provoked. The mom I spoke with cried over her gay son and told me ‘God didn’t approve of his gayness,’ but she knew he couldn’t change. I said, ‘If you can’t love all of him, your love is conditional and he knows it.’ To see this mother’s pain and her absolute conviction that the ideas she’s been fed about homosexuality were true was heartbreaking. I felt sad for both her and her son. 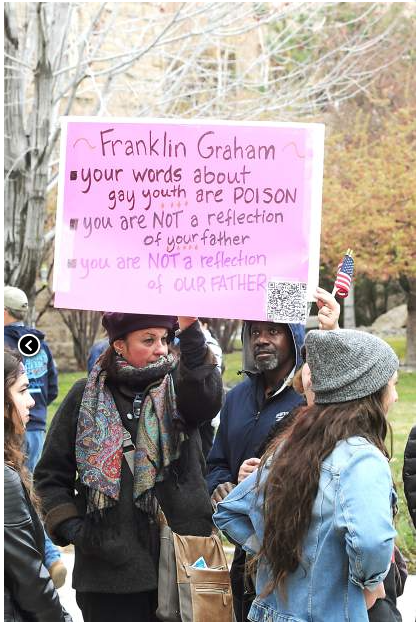 Graham said gay youth are here to break up our families. It’s the church’s teaching that are breaking up families. 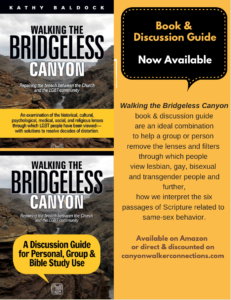 I think it is safe to assume I know more about the subject of sexual orientation and gender identity as they intersect faith than any person who spoke to me, at me, or looked upon me with pity yesterday. I never alluded to my expertise with anyone. There would have been no value or productivity to one-ups-womanship. At the end of my time standing by the exit, Chaplain Jack, who had earlier tried to get me to lower my sign or move, came over to me again. “I just want to thank you for being so gracious while you were here. I didn’t know what to expect, but you handled yourself well. Thank you.” I asked his name, we shook hands. I’m glad I went to the rally. 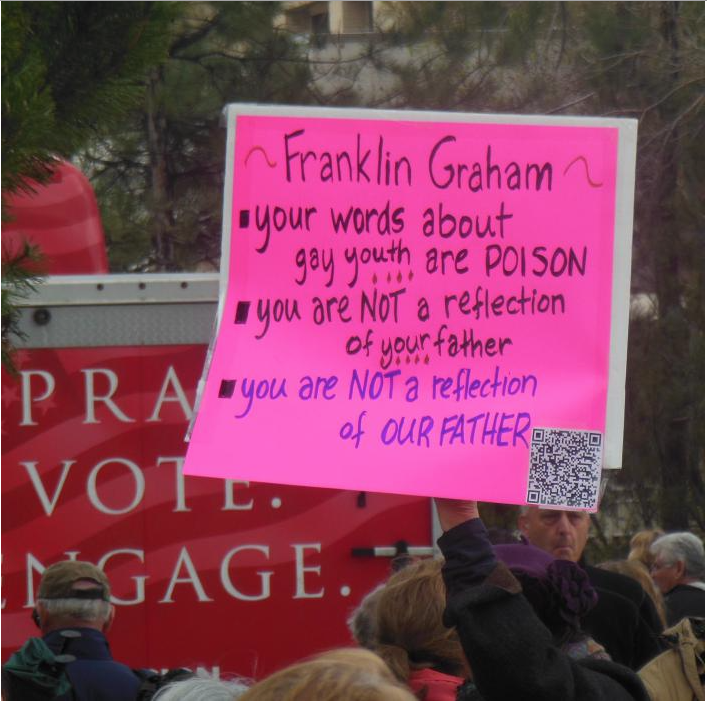 I didn’t want Graham’s words about gay youth to go unchallenged. Sadly though, people overlooked that the details of my sign were about gay youth. There was unmistakable disdain for me, my message, and my presence. That was quite clear. There was a turn-about going on in my head though. 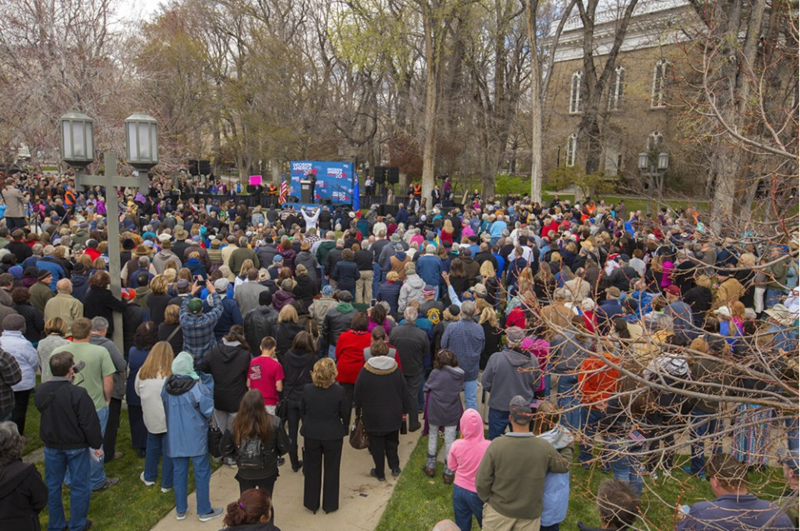 The rally attendees were all there to pray with Franklin Graham for our nation, for the church, for the witness of Christ in the world. 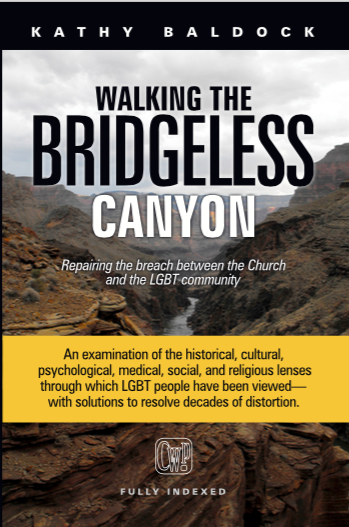 The ones who looked pitifully on me, or interacted with me, presumed they were the ones who know what God says, thinks, and feels about those who are gay. But, a decade ago, I had been just like them. Yesterday though I felt sorrow for their lack of knowledge, for their laziness of seeking after truth, and for their blindness to just believe what their religious leaders, like Franklin Graham, told them to believe. Again, I had been just like them. 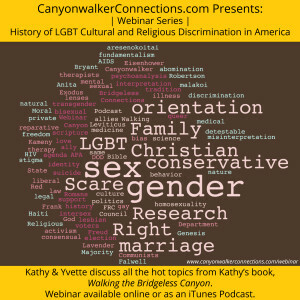 For the sake of the Kingdom of God, for the sake of LGBT people, and for the sake of the conservative church, we need to re-examine Scripture, particularly on issues of inclusion and justice. The church needs to listen. May it be now. Carson City was stop 12/50. 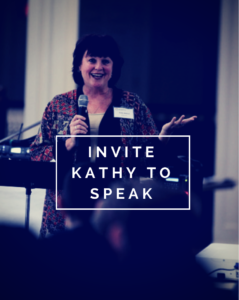 Consider being a witness for Christ at a Christian prayer rally. Here is the schedule. 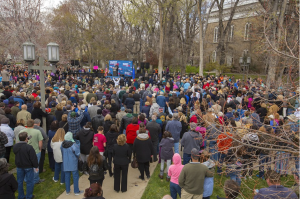 Rallies are typically on the Capitol grounds. As my buddy Gilbert says, “Show up and show out!” Be gracious and polite and STAND against injustice. The late summer and fall calendar is not yet established. The big Franklin bus is going to ALL states. Nevada was 12/50.